Supplying a full range of quality car, van, truck, bus and agri tyres backed up by a service level that is simply second to none, Loughrea Tyre Centre has over the last 18 years established itself as one of the premier tyre retailers in the West of Ireland. We travelled to County Galway and caught up with amiable founder / proprietor Thomas Monahan to find out more. It would be no exaggeration to suggest that Thomas Monahan knows his chosen line of business inside-out. The Galway man has worked with tyres for almost four decades and has for the latter half of that time overseen the development of Loughrea Tyre Centre into a market-leading operation, stocking a full range of tyres for cars, vans, buses, trucks, jeeps, tractors, quads, construction equipment, trailers, agri machinery and everything in between. Tyres are sourced, supplied and fitted in a professional, conscientious and cost-effective manner, outstanding service levels ensuring that the thriving operation continues to grow on the back of a steady flow of repeat custom complemented by new business through positive referrals. Providing the best brands and accessories at the best price - including Continental, Dunlop, Firestone, Goodyear, Hankook, Michelin, Pirelli, Semperit, Federal, Bridgestone and BKT / Agrigear - Loughrea Tyre Centre also stocks rims, batteries, wipers and all parts and accessories associated with the tyre trade, making it the first port of call for tyre inspections, puncture repairs, tyre replacements, alloy wheel repair, wheel alignment and wheel balancing, with 24/7 breakdown recovery / roadside assistance also provided. Very much the archetypal hands-on proprietor, Tom and his ex business partner Gerry built up the business by implementing an ethos of strong customer service, with an emphasis on quality and safety at all times. 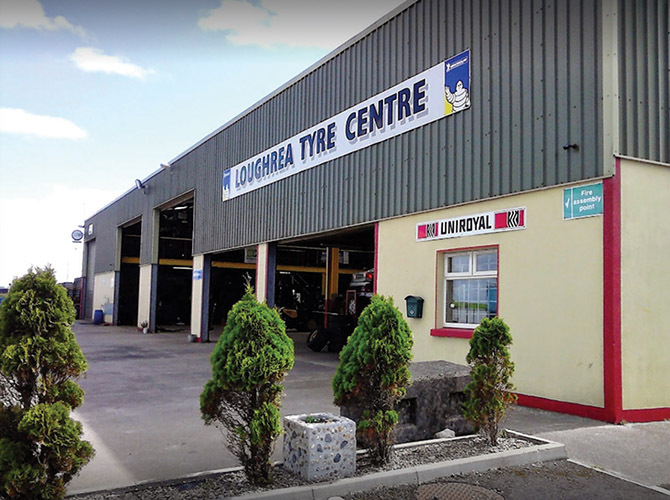 Tom subsequently bought out the business and little wonder Loughrea Tyre Centre has gone from strength to strength since its inception in 2000, serving tens of thousands of customers both locally and nationwide! Every possible tyre type is provided, literally from a wheelbarrow up to the largest truck, trailer or tractor, with a large number of haulage contractors included amongst the loyal customer base. “As well as service, you also have to be strong on price and quality. Those are the three main things customers are looking for - service, quality and price - and you are expectedly to deliver on all three. In total, gainful employment is generated directly for a crew of seven, including four full-time. Thomas also does a little bit of farming - sheep, sucklers, horses - with his son Jamie handling most of the work on the family farm. As part of the local farming community, he points out that agri accounts for a large percentage of overall business: “We sell a lot of agri tyres. This is a big farming area and I'd say about 40% of my customers are farmers. As well as tyres for tractors, jeeps and machinery, a lot of them would have a car or two and their wives and children might have cars, too, so we get a lot of business that way. Again, it's knock-on business that you are getting from looking after people. Loughrea Tyre Centre carries a large range of tyres of all makes and sizes, although demand is such that they tend to pass through quickly. With two service units on the road, a substantial catchment area is covered daily from Galway City to Athlone. As for the goals of the business moving forward, Thomas says the focus will be on continuing to provide high-quality tyre solutions and optimal service levels: “We'll stay the same and concentrate on what we are doing. I have no intention of expanding the business or opening new premises. I'm happy with the size we are at and we're very busy at the moment,” he concludes.